This post could easily be titled "How to set your dining room chairs on fire," or "How to needlessly pay twice as much for something." Oh, the learning experience this project became! Let's start with possible title Number 1: How to set your dining room chairs on fire. It's not all that funny and more scary than anything. It ended well, lesson learned without damage. These are the instructions from the make-a-lamp-kit. 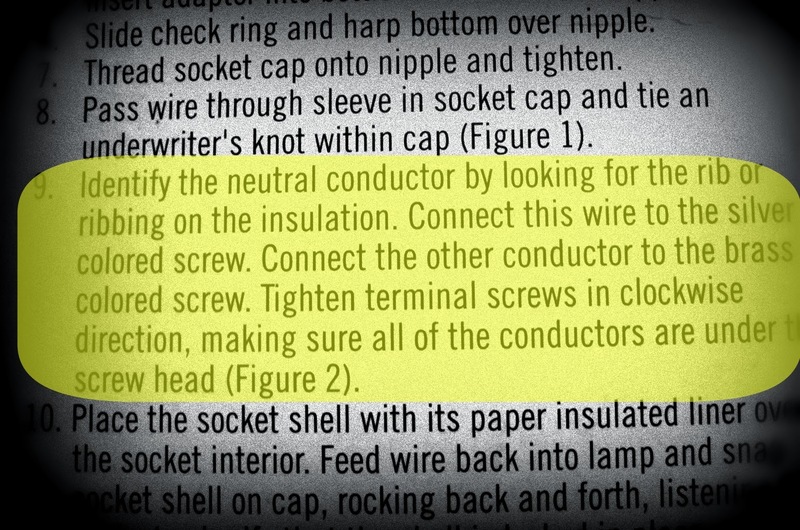 In short, the highlighted section explains which wire goes to which screw for the correct electrical current. I didn't read it. 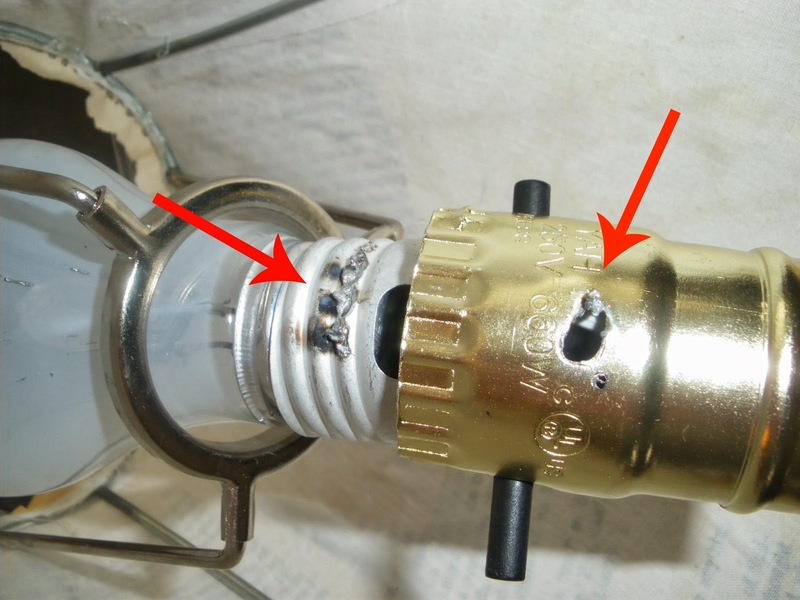 And this happened: the wrong flow of electricity caused instant sparks and popping noises as soon as the lamp was turned on. In a matter of seconds the electricity melted through the socket cap ruining the socket, and the light bulb, and sending ashy sparks onto my upholstered dining chairs charring them slightly. Learn from me: read the directions and avoid this fire hazard. Next possible title: "How to needlessly pay twice as much for something." While researching the "how-to" of DIY lamps I saw many many lamps and kits, including how to build your own lamp kit. (click here for Pinterest DIY lamps) I'm not a die-hard DIYer, thank you very much, so I'll take the ready made kit. This Make-a-Lamp kit was about $11 at Home Depot. Key phrase here: Make a Lamp. I bought two. After the near-fire-episode I stopped by the light-bulb aisle of Walmart hoping for a replacement part (the socket cap). Not only did I find the replacement socket for a couple of bucks, but also a Make a Bottle Lamp Kit for almost HALF of what I paid for the Make a Lamp Kit. UGH!!!! Not sure what the difference is between the two kits (looked the same to me but I didn't look too hard because I didn't really want to know what needless pieces I'd paid double for). 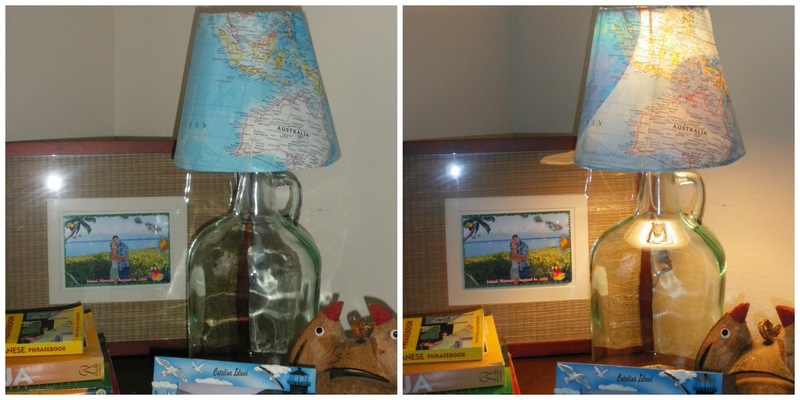 I can tell you that the Make a Lamp Kit works just fine in turning a bottle into a lamp. And to make my bruised ego feel better, I'd say it works twice as well. Anyways, onto the lamp pieces. "Mom, you're stealing!" my four year old son said after watching me salvage these jugs from a trash can. "Honey, when we're treasure hunting on trash day its not stealing. Its free. 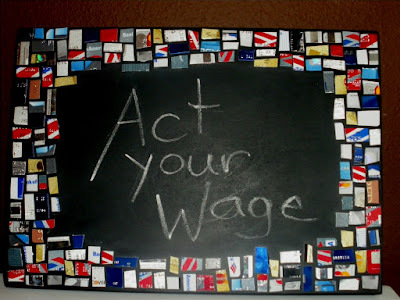 If we don't take it, the garbage truck will. Its ok."
And then I'm grinning from ear to ear because these jugs are quality! Not some wussy container made of just enough material to do the job, but these are seriously made bottles, thick and heavy. If someone breaks into my house I'm grabbing one of these by the handle and swinging. A baseball bat couldn't do worse. The lampshades came from a local thrift store, not a bad price, and they were in great shape, just dated. After ripping off the old fabric they were recovered in muslin. 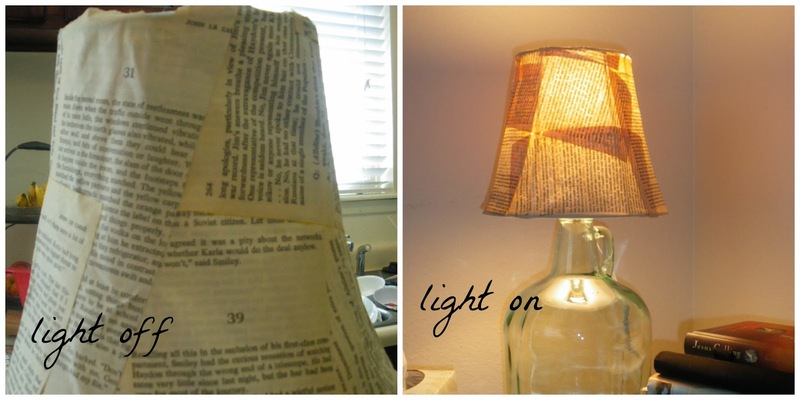 Check out these Pinterest DIY lamps. 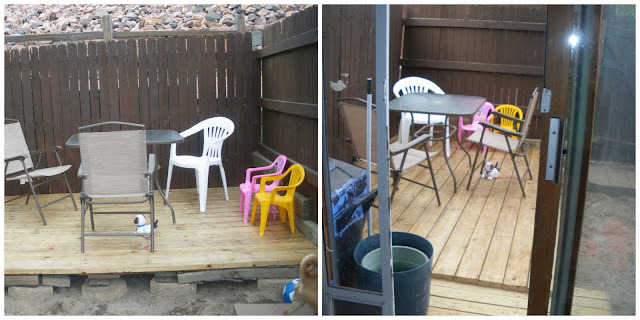 I checked out several of these sites to piece together my own how-to for this project. Then the paper was Mod Podged on, but ONLY on the underside of the paper, just in case I wanted to paint the paper afterwards for an aging affect. Luckily, the pages were aged enough on their own. Totally love how the light shines through the overlapped pages. I totally staged his lamp. In reality this table is half covered in laundry or piled with the kids books and toys. The map was two sided, you can see the pictures from the back peeking through when lit. A lovely visual. Love, love, LOVE these, Audra!! Of course, the fire stuff, not so much, but all's well that ends well and you have two fabulously original, brand new lamps! Awesome! Love this. Great tutorial. I have a jug I may turn into a lamp. Love the lamp and thanks for sharing with us how you created it! I want to go buy a bottle of that wine and make one myself! thanks for stopping by and letting me know you like my Ann Taylor Lampshade! The map is just gorgeous! I've seen several map projects, and I'll be adding this one to my list!! Those are great lamps! Love how you reused those old wine jugs. I am your newest follower. Stop by for a visit when you have a chance. Very nice job repurposing the wine jug. Thank you for sharing with the Clever Chicks Blog Hop! I hope you’ll join us again next week! Howdy Audra! I wanted to thank you for stopping by my Vase Lamp tutorial post. I had to come check out your jug lamps and they rock! 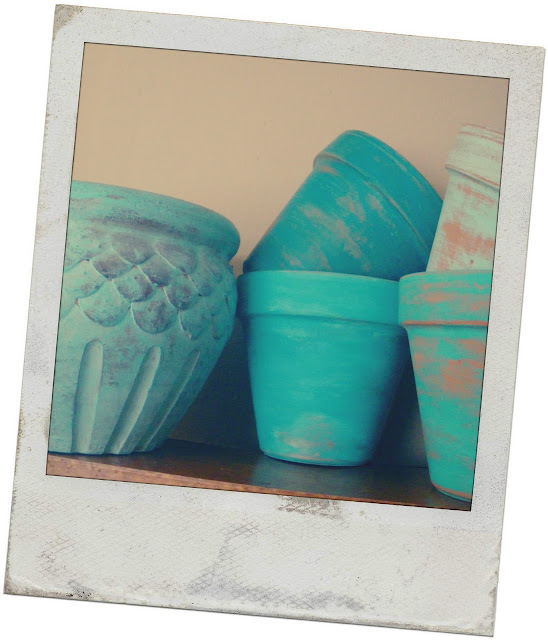 I've pinned it to a community Pinterest board that I participate in called DIY PARTY. Your lamps are so pretty. Oh gosh! I just love those lamps. I've used maps and book pages as design ideas before, like book covers and vintage-looking art by exposing them to a coffee solution. It makes them look quite old and classy. Anyway, I'm going to try my technique with that DIY feat of yours to make the most adorable bedside lamps. Thank you so much for sharing! All the best!